Do you remember you parent's always saying "Don't slam the door"? There's a good reason, not to mention the noise and cracked plaster. Your spring latch takes lots of abuse over the years and this one finally cracked. The fatigue generated by years of abuse on the cast metal latch finally caught up. 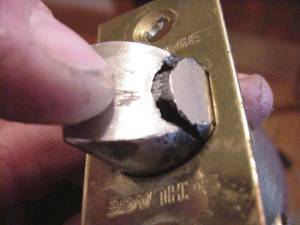 Luckily companies like Schlage, offer replacement parts and the repair is relatively simple. Don't forget to lubricate the works before re-assembling. Start by removed the screw from the knob. Loosen and remove the screws securing the springlatch. The base of the handle may have a screw which needs to be removed. Push the works back through the hole to remove the handle portion.